Helping CEOs and senior executives build their brands on social media. Your customers use social media – does your CEO? Does your CEO struggle to see the relevance of social media to your brand? Is your executive team trying to engage with potential customers on social media? Let us help you create content that supports your corporate communications strategy. – Ryan Holder, CEO of Hootsuite, writing on Fast Company. We can show you how to create engaging conversations with relevant social media audiences. Simply choose the workshop level that suits you – both are ideal for 121 sessions or teams of four to six people. Then book a 1.5 hour introduction (£120+VAT), a 3 hour strategy briefing (£240+VAT), or a 5 hour intensive development (£480+VAT). – CEO of an innovative technology firm. We focus on what you say, why you say it and who you are talking to – not just the mechanics. We look at the 80/20 rule, how to build your personal authority and why organic growth is healthier for you. We also identify some of the risks you face, how to set SMART objectives and why engaging, although important, is not enough. Social Media is dynamic, which makes it hard for people to keep up with the latest developments. Busy executives also struggle to find time to get started or to give it the attention it deserves. We will tailor our workshop to your needs and show you how to make social media work for you. Workshop 2 – Struggling Starters to Cautiously Confident. This is for people with little or no social media experience who want to get started. We will focus on using Twitter because this is one of the most accessible platforms. However, we will look at other platforms and discuss their merits for different types of business. This workshop is ideal for those who want to start building a professional social media presence for their business, social enterprise, community group or their personal brand. It is also for those who have an account on one or more platforms but don’t know what to do next. You may have sent out messages and connected with a few people but are struggling to fit social media into your communications plan. This will cover similar ground to Workshop One but with more emphasis on creating relevant and interesting content. In particular, it will focus on listening to and learning about your audiences, and connecting with people who matter. It will also help you build an authentic brand with your community. This is for people who have social media accounts but are struggling to engage with relevant people. It is also for those who have started using social media but feel their approach is lacking a certain sparkle. It is particularly relevant for people who want to fit social media into their wider sales and marketing strategy. These workshops are run by Huw Sayer*. Please email him for more details or call him to discuss your specific needs. 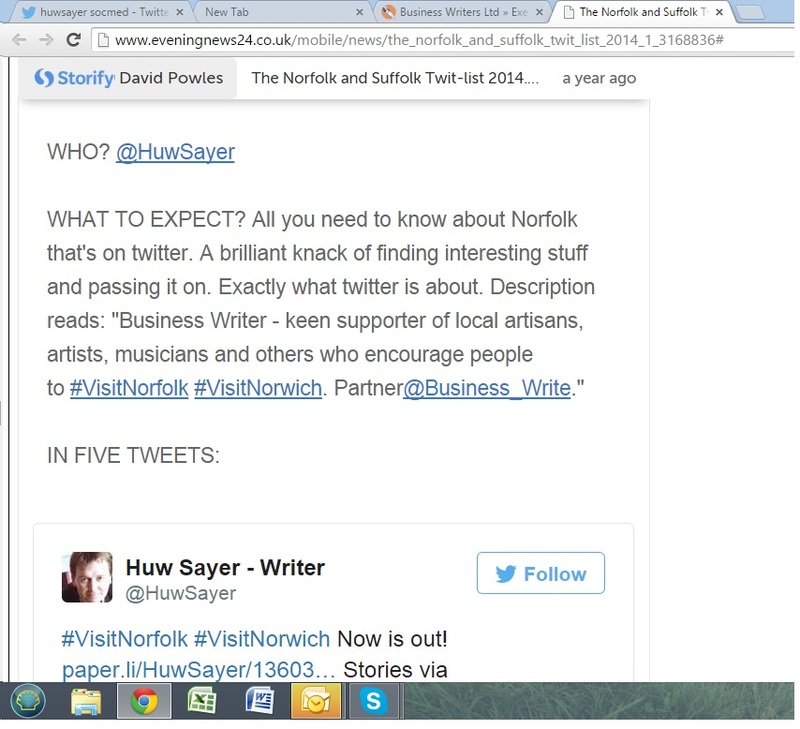 In January 2014, The Norfolk Magazine profiled Huw in an article on social media, saying he was “recommended as a great Norfolk online ambassador” for his work supporting community groups and cultural events across the region. Around the same time the Evening News ran a poll that named him as one of the 20 most influential tweeters in the region. Since then he has spoken a various business seminars across the region and taken over as co-organiser of Hot Source, the innovation forum for Norfolk, including running its Twitter and LinkedIn accounts.